Allowing safe access to elevated controls or equipment, our industrial ladder stairs provide a protected workspace so your workers can access the equipment they need. All our OSHA compliant work platforms and industrial metal stairs are precision manufactured, fully engineered with heavy gauge steel and aluminum and suitable for nearly all industry application. And as always – each component is fully stocked and ready to ship today! 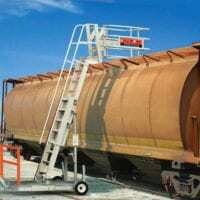 Using a combination of 5 components: Prefabricated Metal Stairs, Metal work Platforms, Industrial Handrails, Aluminum Ladders and Tower Support, our modular design is sturdy, requires no fabrication and quickly bolts together to provide metal stairs, crossovers and many other configurations for safe access over pipes, dike walls, or other obstructions. Includes tower support main body assembly. Includes connection collers to fasten extension kit to base unit. After we received the gangway, it fit perfectly. Phyllis Sikes is very punctual and polite – she did a great job and made this a success. After we received the gangway, it fit perfectly.